You'll receive it in the mail within days. Free. Free Shipping, too. I wrote this book specifically for busy business owners -- as the marketing book you will actually read cover to cover. You can read the whole thing in about 30 minutes. Plus, it's small so you can keep on or in your desk for quick reference. If you want a larger (5x8) version, you can order it on Amazon but we're mailing you the 3.5" X 5.5" version (the originally intended size). 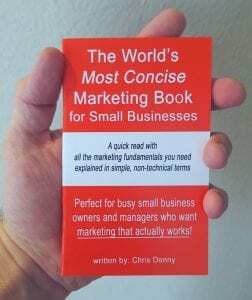 The pocket-sized book has normal-sized font so it's easy to read and it's packed with marketing fundamentals every business owner needs to have a handle on in this day and age. Imagine taking a normal-length book and then editing and re-editing until what's left is only what matters. That's what we've done with The World's Most Concise Marketing Book for Small Businesses. 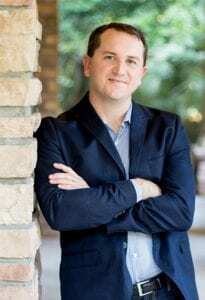 Our mission is to help businesses grow and I genuinely hope this book helps you increase your sales, increase your profits, employ people, and meet your goals. p.s., be clear, this is a real book -- not a pdf or download. It will arrive in the mail within several days. Complete this form and we’ll mail you the book within a few days.